Known as the “Bicycle Capital of the Northwest” and as the headquarters of several high-tech firms including Microsoft and Nintendo, Redmond is recognized for its excellent quality of life. A short 20 minutes east of Seattle, the city has a dynamic and diverse downtown core and has maintained its green Northwest character while enjoying vibrant growth. Along with cultivating a vigorous economy and cultural life, the city prides itself on an extensive park system with a wide-ranging network of trails. Don’t leave Redmond without seeing Marymoor Park, walking the Sammamish trail, and visiting the municipal campus filled with sculptures. The city was incorporated in 1912. Before pioneers from the eastern US arrived, the Redmond area was covered with dense forest, and the Duwamish and Sammamish peoples lived there. It was first settled as a logging town on the Sammamish River in the early 1870’s. 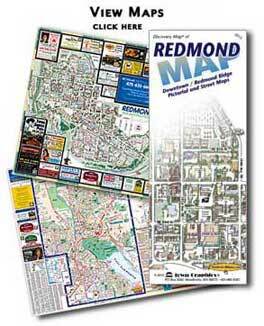 In 2008, Redmond had a population of 51,530. Major employers include AT&T Wireless Services, Inc.; Eddie Bauer; Eurest Dining Services; Genie Industries; Group Health Cooperative Hospital; Honeywell International, Inc.; Medtronic Physio-Control Corp.; Microsoft; Nintendo; Safeco; Volt Technical Resources, LLC.